Roseau, Dominica – July 24, 2009…… Prime Minister, Hon. Roosevelt Skerrit will attend a reception at the State House this evening to celebrate 198 years since the Bolivarian Republic of Venezuela gained its independence from Spain. Today, Friday, July 24, 2009 is also a special day for the people of Venezuela because it is the anniversary of the birth of the revolutionary leader, Simon Bolivar, who liberated Venezuela from Spanish rule. This year also marks thirty years since Dominica established diplomatic relations with Venezuela. Venezuela became the first country to establish an embassy in Dominica in January, 1980. Addresses at tonight’s reception will be delivered by Prime Minister, Hon. 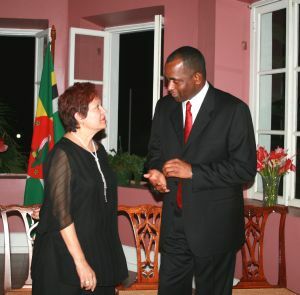 Roosevelt Skerrit and Venezuela’s Ambassador to Dominica, Her Excellency, Carmen Martinez de Grijalva. The celebration of Venezuela’s independence is coming at a time when the relationship between Dominica and Venezuela is indisputably at its strongest. On June 13, 2009, the Government of Dominica welcomed Venezuela’s President, His Excellency Hugo Chavez Frias to Dominica to formally commission the Waitukubuli Fuel Storage and Distribution facility. The two countries continue to deepen their bilateral relationship through cooperation in energy, housing, infrastructural development, education, agriculture, tourism and private sector development.